For the months of June and July, Killer Characters is having a Cozy Reads of Summer Giveaway! Leave a comment and you could win a signed paperback or an e-book! Winners will be selected each day! Helen Evans from Susan McBride's new River Road Mysteries series. My name is Helen Evans. I’m a 75-year-old widow and grandmother of nine with a tomcat named Amber (my granddaughter, Nancy, found him and named him that because of the color of his eyes). Fifty years ago, my husband Joe and I moved to tiny River Bend, Illinois, because it was such a lovely and safe place to live. Nestled between the bluffs along the Mississippi, it’s an hour from St. Louis and a hop, skip, and jump away from Alton; but it’s galaxies away from the big city in most respects. Or at least it had been until Milton Grone was murdered. All right, so Milton wasn’t very well liked. He treated his first wife and their kids rather shabbily, and he isn’t doing much better with his second wife. He sold a pristine parcel of land adjacent to River Bend to a water park—land that his father had promised to the town. His next-door neighbor, my dear friend Felicity, had to endure Milton’s nastiness for years, including his taking pot-shots at her kitty with his rifle. He’s never paid his community dues, which riles the town’s board to no end. Even the minister has a beef with him. And if the local minister doesn’t like you, who does? I’m sure everyone in River Bend would agree that Milton Grone was a lost cause (honestly, most in town feel the killer deserves some kind of medal), which is probably why Sheriff Biddle didn’t seem in such a hurry to find who did it. Instead, he fixated on sweet Felicity, who wouldn’t hurt a fly, simply because it was her shovel that did Grone in. So what was I supposed to do? Sit idly by and watch my friend get arrested for a murder she didn’t commit? Hardly! Not that I’m a busybody, but I do keep my nose to the ground. It’s hard not to when River Bend has its fill of gossips (yes, I’m talking about you, Clara Foley!). I love mysteries, puzzles, and crosswords. They keep my mind from rusting like old patio furniture. Putting two and two together where Milton Grone’s murder was concerned didn’t take as long as one would imagine. I just had to keep my eyes open and see the things that no one else was seeing (or was it that they really didn’t want to look?). Susan McBride is the USA Today bestselling author of Blue Blood and four other award-winning Debutante Dropout Mysteries. A sixth in that series, Say Yes to the Dress, will be out from HarperCollins/Avon in 2015. 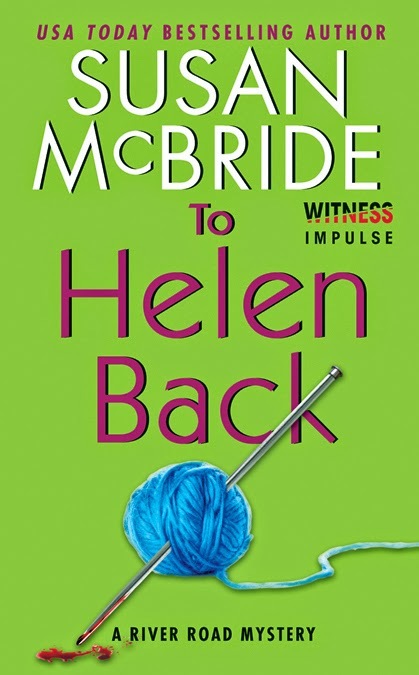 To Helen Back is the first of her River Road Mysteries from HarperCollins’ Witness Impulse imprints with Mad as Helen to follow in late July and Not a Chance in Helen in late September. Visit her web site for more scoop! This first in a new series sounds delightful! I love Helen already! Thank you Susan and Killer Characters for offering up a chance to win this read! Sandy, I love Helen, too! She's a lot like my grandmother who was also named Helen. :-) Yes, thanks to Killer Characters (and Ms. Denise!) for having Helen guest on the blog! My mom's name is Helen (she's deceased but will always be with me), her parents were from Russia and called her Helena. Thank you Susan and Killer Characters (especially Helen!) for awarding me this has-to-be-great read! I've contacted Susan through her website and since I have chosen to receive the paperback version due out on July 8th I'll be hangin' in here for a bit. But, I'm sure it will be worth the wait! I hope you enjoy the new series! These "Helen" books were a hoot to write! This sounds like a great new series. Looking forward to reading it. Sounds like a good read—thanks for the opportunity to win a copy! Thanks for entering to win a copy of To Helen Back...and good luck! Looking forward to reading this new series with a cast of characters that sound interesting and fun. You can't go wrong with a cat in the group. I'm glad you like the title! These books originally all had "murder" in the title and then my agent suggested using Helen puns (because there are so many good ones!). I think it worked out great! Love stories that feature seniors, and yes, I am one! Sounds like a wonderful series! I read it as soon as I heard about it. I thoroughly enjoyed it, and am waiting for the second to come out. I may preorder it just to make sure I don't miss getting it as soon as it's available. Well, Janet! You rock! I can't wait for you to read Mad as Helen. It's even more fun than To Helen Back! Always looking for new series. Looks like a fun one! New author for me and it sounds interesting. I saw a post about this book the other day. Sound like a great read for us grandmas! Love books with feisty Grandmothers! I love the sound of Helen, feisty! Being in my 70's myself - I think Helen would make a great neighbor! I just finished this book, and thought it was great! Such fun, and a bunch of darling characters. Can't wait for the next one...but, in the meantime, will get some friends started on the series. Thanks,Susan! Sounds like a fun read and look forward to adding it to my TBR. I used to travel to Alton, IL quite a bit for business---a lovely town. So the setting for this mystery interests me. I'd love to win this cozy. Sounds interesting. I like the yarn on the cover. Taking pot shots at the neighbors cat? I'll murder him! i love this series, Helen is a hoot! I think of myself as a feisty grandmother! Love your books!! Helen sounds like a feisty and resourceful character. I look forward to reading more about her. I really love that she is a senior. She is even older than me! This series is so great!! I also like mysteries, puzzles and crosswords. But I'm not quite as old as Helen. This book sounds great. This sounds like the perfect book to curl up in front of the fireplace and get lost in. I can't wait to read it. Only furry grand babies so far. This sounds like a really fun read & start of series! I have not read any of your books , but would love to win . I am always looking fir new authors . Sounds like it is very good . Thanks . Thanks to all who left comments about To Helen Back. I hope you enjoy the new series! And thanks to Denise and everyone at Killer Characters for having Helen Evans make a guest appearance. She had a great time! Love the cover, will definitely be checking this new series out.